For the second week running, Raith Rovers were left with nothing to show for a spirited performance. Rovers could have taken something from Saturday’s engrossing tussle with Hibs, but unfortunately, the club is beyond the stage of grasping for positives in defeats. As the board acknowledged last week, it’s a results business, and in that respect, Saturday will go down as just the latest failure in a poor run of form stretching back a considerable period of time. Four league defeats in a row and one league win in 11 now has Rovers, for the second season running, looking over their shoulders at the relegation zone after an encouraging start. A defeat to one of Scotland’s biggest clubs is nothing to be ashamed of, but in a league where Rovers should be capable of holding their own, they are currently punching below their weight. Rovers made one change from the side that lost in Dumbarton the previous week with Martin Scott returning to central midfield in place of the injured Kevin Moon. There was no place in the squad for Ross Perry, despite the defender’s return from suspension. The first half was largely dominated by Hibs, with only weak finishing, in particular from Dominque Malonga, preventing the visitors from scoring the first goal. The Congolese striker managed to find gaping holes in an unconvincing Raith defence on a number of occasions, but he could not generate the power in his efforts to beat the alert David McGurn. David Gray also missed a sitter, failing to make a proper connection with a ball to the back post when the goal appeared to be gaping, while Liam Craig also broke through but clipped his effort wide. Raith were working extremely hard, with Scott and Callachan tenacious in midfield, but it was somewhat against the run of play that the home side snatched a 40th minute lead. In a swift counter attack, Nade did well to spin past his marker before playing a glorious ball to Barrie McKay in space on the right wing. The on-loan Rangers teenager still had plenty to do, but he showed great pace to keep ahead of the chasing Hibs defenders, then showed a touch of class to fire a rocket shot past Mark Oxley at his near post. 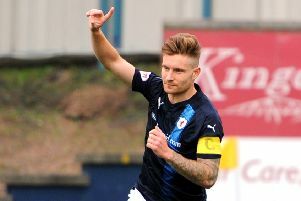 It was the first time Raith had scored the opening goal in a league match since September 20 so it was disappointing to say the least that they were able to protect their advantage for only four minutes. With the last attack of the first half, Malonga again peeled away from his markers with ease, and although this time his shot beat McGurn, it required a touch from Jason Cummings to deflect it past Rory McKeown on the line. Raith appeared to get over that setback during the half-time interval as they took the game to Hibs from the start of the second half, showing the purposeful look of a team that badly wanted to win the game. There was constant, if not intense pressure on the Hibs defence with Jason Thomson breaking forward to force a save from Oxley at his near post on 61 minutes. The lively Mark Stewart also had a chance to bear down on goal but a loose first touch forced him wide allowing Oxley to intervene, while he also saw a close range attempt blocked by a defender. Raith’s big chance arrived with 15 minutes left as Scott’s pinpoint back post ball was nodded down by Thomson to Nade in space, but the Frenchman opted for power and blasted wildly wide from 12 yards. Rovers then paid the price for a basic lapse of concentration at a set piece three minutes later as Hibs took a short corner and Scott Allan’s cross found Liam Fontaine completely unmarked to bullet a header past McGurn. The loss of this goal exposed Raith’s fragile confidence levels as straight from the re-start, Ryan Conroy gifted the ball to Cummings and McGurn had to be at full stretch to tip wide the striker’s effort. Hibs killer third goal was only delayed by a further 90 seconds though as Scott turned into trouble on the edge of his own box, allowing Hanlon to play in Malonga who finally grabbed the goal he had threatened in the first half. For all the encouragement over certain aspects of Raith’s display, the result, and in particular the late collapse, meant that once again we were left more questions than answers. For under-fire manager Grant Murray, the answers cannot come soon enough. Raith Rovers: McGurn, Thomson, Watson, Hill, McKeown, Conroy (Anderson 82), Callachan, Scott, McKay, Stewart, Nade (Elliot 90). Not used: Vaughan, Ellis, Matthews, Barr, Laidlaw. Hibernian: Oxley, Gray (Booth 72), Hanlon, Fontaine, Stevenson, Allan, Robertson, Craig, Handling (Stanton 68), Malonga (Heffernan 90), Cummings. Not used: Harris, Sinclair, Kennedy, Perntreou.